As colder weather begins to settle in, the State Fire Marshal’s Office is reminding residents that this is a dangerous time of year for home fires. Factors such as home heating, holiday decorations, winter storms and candle usage all contribute to a greater risk of home fires. Candles – Consider using battery operated candles, which can look, smell and feel like real candles. Carefully read and follow the manufacturer’s use and safety instructions. Place candles on a flat surface and in a sturdy container. Place candles where they cannot tip over. Extinguish candles after each use, when leaving home or going to sleep. Heating – Use caution when trying to stay warm at home. Keep heat sources at least three feet away from anything that can burn. Unplug heat producing appliances, and extinguish embers in the fireplace before going to sleep, when unattended, or leaving home. Only plug one heat-producing appliance into an electrical outlet at a time; never into an extension cord. Maintain heating equipment and chimneys in good working condition. Have them professionally cleaned and inspected once a year. If using a fireplace, use a glass or metal fire screen to catch sparks and rolling logs. Smoke Alarms – Make sure your home’s smoke alarms are in working order. Install alarms inside and outside all sleeping areas, and on every level of your home. Follow manufacturer’s instructions to ensure proper installation and maintenance. Test your smoke alarm once a month to ensure they are working. Replace any alarms that fail testing. Replace all smoke alarms that are 10 years old or older. 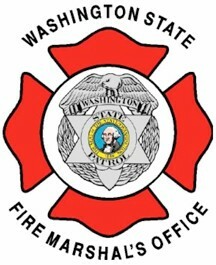 To learn more about winter fire safety and how to prevent home fires, visit the State Fire Marshal’s website at: http://www.wsp.wa.gov/fire/firemars.htm.